Delta Environmental Centre had long cherished the idea of a sensory trail, allowing everyone including the physically chalenged to appreciate aspects of nature which do not first come to mind, such as texture, temperature, aroma and shape. 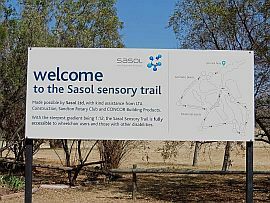 The result of the dream, the SASOL Sensory Trail, was opened in August 1997, with the assistance of Delta’s long time partner in conservation, SASOL. 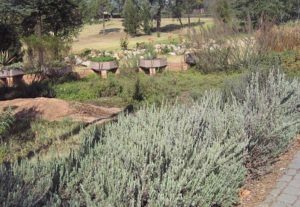 The Trail has added a new dimension to the facilities in Delta Park, especially as it was the first of its kind in Greater Johannesburg. Learners on this trail are exposed to nature through their senses, making it a memorable experience. Disabled users also have close contact with the natural environment as all the points of interest have been made accessible for the blind and wheelchair-bound. The 103 metre trail was designed by Michael Thomas (an architect) and constructed by LTA Construction and developed in conjuction with Rob and Julie Filmer, founders of the Eco-Access, an organisation focused on making the environment accessible to the physically challenged. They ensured that the gradient was never more than 1:12, allowing easy acccess for wheelchairs. Concreted octagons have been situated at selected spots on the SASOL Sensory Trail to coincide with a point of interest. Brick paving, provided by CONCOR Building Products, has been used to connect all 14 octagons. These octagons are large enough to allow wheelchair users to turn around easily. 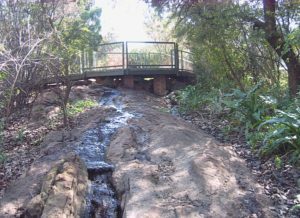 A recycled plastic “wooden”-slatted boardwalk was constructed by the Sandton Rotary Club over the top of the granite outcrop to enable users to get an elevated view of the Trail area and to listen to water trickling over the rocks beneath them. Signs highlighting the sensory focus in each section have been located in carefully selected spots to assist with interpretation. Braille has also been used on these signs. Most of the plants in the area are indigenous and are used to enhance the sensory experience, eg. appearance, texture or aroma. Where appropriate, the medicinal values of plants are mentioned.